Full disclosure: GoPro flew me and a handful of other journalists out to Vail, Colorado for a few days, put us up in a hotel, and put some food in our bellies so that we could try out their new camera on some fun adventure activities. This is the GoPro Hero4 Session, coming July 12th, and it represents one of the company’s greatest leaps forward in product design and usability—as I discovered first-hand while paddling down whitewater rapids. But first, what makes this camera so great? To start with, the Session is small. How small? Ridiculously small. Just under an inch and a half in every direction. In fact, it’s 50% smaller (and at 3.1 oz, 40% lighter) than other HERO4 cameras. On paper, that may not sound like much, but when you’re 35 feet off the ground, swinging between obstacles in a high ropes course, it’s nice not to feel like you’re wearing the extra weight. Ask me how I know. GoPro’s high ropes course challenged us to navigate a series of rope-based obstacles high above the ground. Each obstacle varied in difficulty and approach; the course ended with a fast-rope down to the ground. I wore the Session around my ankle using a new GoPro mount—The Strap—which let me capture a unique from-the-ground perspective. In order to take advantage of the Session’s small size and weight, GoPro has created a host of new mounting options that allow for angles you weren’t able to get with previous cameras. One of these new mounts is The Strap ($60), a low-profile hand strap that makes users feel like Iron Man. It makes for a fluid, dynamic perspective on the action and, equally important, wearing the kit felt good—less obtrusive than wearing a winter glove. While on the course, I couldn’t help thinking about all the different activities that The Strap could be used for to produce even more interesting results. Ice climbing. Air Hockey. MMA. And that’s just one of the new mounting options. There’s also a low-profile frame which allows the Session to be mounted just fractions of an inch above any surface—and rotate 180 degrees. Meanwhile, the included Ball Joint Buckle allows for subtle orientation corrections and essentially eliminates the need for an elbow joint when side-mounting to a helmet or other vertical surfaces. Okay, so the Session is small—but what about a waterproof case? Won’t that make the camera bulkier? Nope! It doesn’t need one. The Session is waterproof out-of-housing to 33 feet. And without the need for a housing, the Session’s dual mic system picks up underwater sounds better than the Heroes before it. Again, how do I know? Because thanks to the Strap and that dual-mic system, I’m pretty sure I just captured some of the most dynamic pole spearfishing video ever. Over the 4th of July weekend, I traveled to Santa Cruz Island—part of Channel Islands National Park—to do some kayaking, camping, and spearfishing. Sadly, the area had been pretty fished out, but I still managed to nab one for dinner. I used The Strap to get a “hands-on” perspective of my kill. In order to record quality sound underwater and above the surface without a case, GoPro’s engineers designed a drainage system inspired by the human ear to aid in water-clearing post-submersion. According to GoPro, the system also dynamically reduces wind noise to improve sound during windy activities like skiing, biking, and motorcycling. Okay, so how easy is the Session to use? 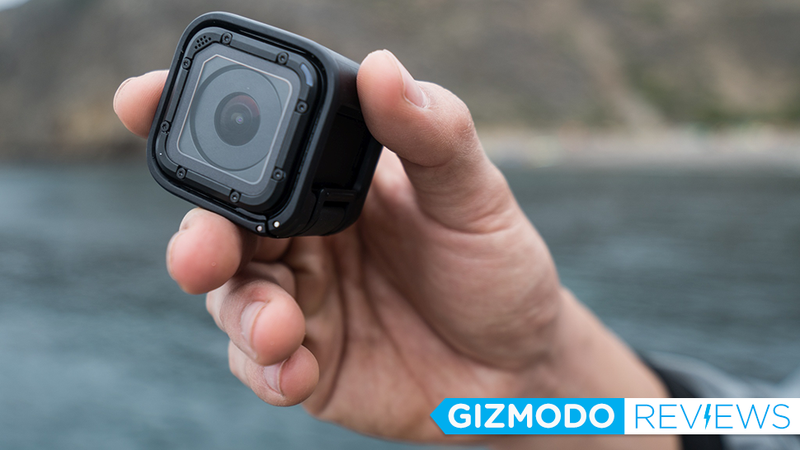 GoPro now has a one-button solution that not only powers the camera on, but also starts recording as well. You can simply press the button and jump straight into whatever activity you’re doing, and it’ll begin capturing video a few seconds later. Or hold it down the button to start shooting timelapse photos instead. Remember when I mentioned whitewater rafting? It’s an activity that requires both hands, and it was a great way to see just how useful the feature is. We tackled a series of Class III and IV rapids while rafting the Lower Eagle River. The water levels were high due to the recent snowmelt, so it made for an exciting trip. I wore the Session on my hand using The Strap, which secured the camera and gave a lot of control over positioning. The Session’s one-touch recording allowed me to concentrate on paddling during intense moments of whitewater. Not only was the one-touch recording convenient, it also seems to help conserve battery—which is important, because the Session’s battery is not removable. Short battery life has always been an issue with GoPro cameras in the past, but GoPro claims that the session gets a full two hours while recording in 1080p/30. While I haven’t timed this exactly, I did use the camera very extensively while on the three-hour long whitewater rafting trip; the Session came out with 40% battery left. What else should you know about the Session? Well, it doesn’t have an LCD screen, for one. You need to use the GoPro app or an external remote control to change its settings; and use the app to aim the camera and review your video afterwards. Also, while many features from the Hero4 Silver and Black cameras do carry over (such as Protune for video, Superview wide-angle recording, and Highlight Tagging) some features like Protune for photos aren’t present. Also, your recording modes top out at 1080p60, 720p100, and 1440p30—no 4K and no buttery smooth 720p at 240fps slow-mo footage. Still, the Session’s image quality is pretty good; though my fellow reviewer Brent Rose definitely noticed a difference between Hero4 Session and Hero4 Silver video in side-by-side comparisons, I personally can’t tell from my few standalone tests. If you like the idea of having a versatile, durable, waterproof camera for capturing fast-paced moments of life, but the complicated nature of previous GoPro’s two-button design and menu system was a deterrent, then the Session would definitely be worth considering. At $400, it doesn’t have some of the more powerful features of the Hero4 Silver you can get for the same price, like higher framerates, resolutions, and a built-in LCD, and if you’re looking for the best image quality that’s the way you’ll want to go too... but if you ask me, the Session is a lot easier and more fun to use. And if you’re a content creator, adding a Session to your camera kit could enable you to capture some unique perspectives that weren’t available before, effectively enhancing your storytelling abilities. As a content creator myself, I’ll definitely be adding a Session to my toolbox.